The last weekend, during a chance visit to Ishanya Mall at Pune I was surprised to see that they had a nice flea market in the promenade of the mall. The stalls are a mix of everything under the sun. If you stay in Pune, I suggest that you do give this flea market a visit! Right from yummy food, to lovely artifacts that can adorn your house, you get almost all that you want! It was at this flea market that I came across a tiny stall that was displaying products from Tvam, Rustic Art, Aura Vedic and Ruby’s Herbals. I’ve managed to have a look only at the Auravedic products in the tiny cart that they have at Inorbit Mall in Pune. The stall was of the online beauty store, Naturelle. Beauté Naturelle is French for “natural beauty”. It personifies all that is fresh, natural, and effortlessly stylish across all ages. Meghna, is the owner of Naturelle. Here is my review on the site. 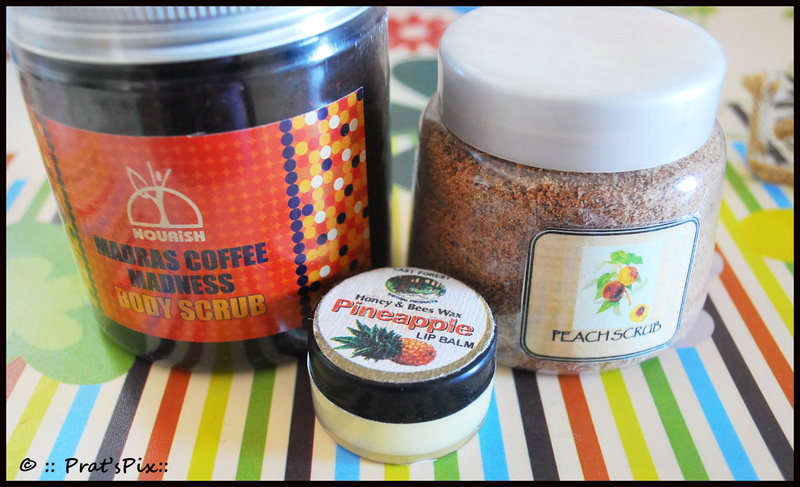 I have purchased some products too, and the individual reviews of them will be posted later. Brands Available: 3.5/5. Auravedic, Rustic Art, Nourish, Tvam, Divine, Last Forest and Jagriti. Note that not all the products from the brands are available. Naturelle stores just three of the Rustic Art products. Getting Registered: 5/5 Very simple. I finished my registration in less than a minute. One drawback here, I wish that the site sent a confirmation mail to the mail id you register with with the username and password. Just as a back up! Navigation: 4/5 – It is not a website that has a large collection of products, so zeroing in to what you want to buy is quite easy. You can shop either by brands or by the category you are looking at, so its fairly simple to locate what you want. Variety and Pricing: 3.5/5. The varieties are quite less, but I guess the quality of the products that are available make up for it. Again, I am sure that as the time passes by and more products are added, this will be a really fun store to shop from. Payment options: Free shipping is valid only for orders over Rs 1000 ( one thousand) and the COD option is available only for people staying in Mumbai and Pune. They ship all over India. Was the packaging good? 5/5: I have already shopped with Naturelle at the Flea Market and at that time she handed over the products in a newspaper bags. 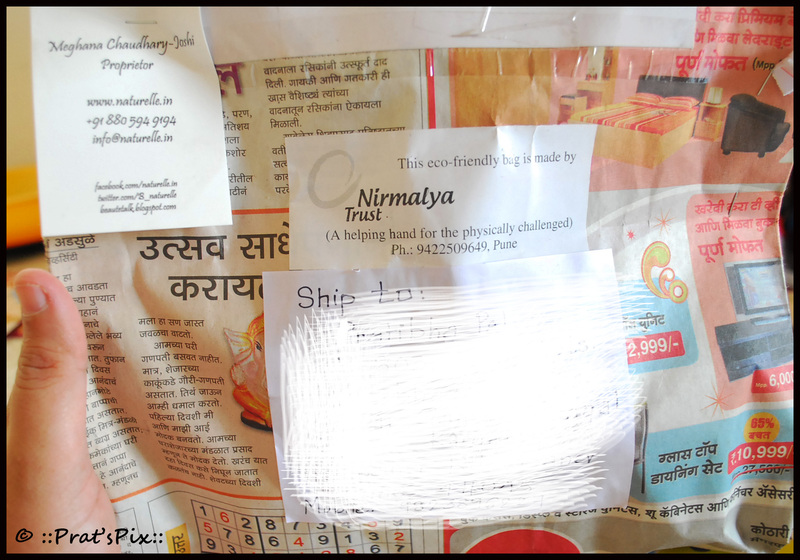 In our conversation, Meghana mentioned that she sources these sturdy, double layered newspaper bags from a local trust called Nirmalaya in Pune which trains and employs Blind individuals. That is a very noble gesture that needs a mention. And yes, my products came in a similar sturdy paper bag packaging. I also need to mention here that the package came with a hand-written note from Meghana, which I liked. It added that personal touch to the order. And yes, everything was bubble wrapped and there would have been no chances of any damages in transit. Was the delivery on time? : 5/5 .I placed my order in the second half on Apr 5th. And I received my order by 6th April, in less than a day. I love that the delivery was so prompt! This is the kind of service that makes a customer happy. Yet another store added to my list that meets the delivery expectations! Will I recommend this site: Yes, but personally I would recommend this to people who are looking at beauty products that are organic and natural. Naturelle has the finest eco-friendly and cruelty-free (no animal testing) organic/natural personal care products under one virtual umbrella. Before you groan, another soap maybe, let me add that I did not buy a soap! This time I decided to explore some new brands. Individual reviews of the products will be posted soon. And if you are looking at some really nice products, I would recommend that you do give this site a visit. I am sure you will not be disappointed. I have tried many lip balms and the best one I find till date has to be the Omved Cinnamon Lip balm. I love the slight warmth the cinnamon leaves on the lips. So if you want to buy a balm, buy the Omved one!